Who is Charm City Roofing? Charm City Roofing is a full-service licensed and insured roofing contractor, specializing in roof repair and roof replacement. Our repair and replacement services cover all roof types. Flat, pitched, wood, EPDM synthetic rubber, it doesn’t matter. Our roofers do it all in a clean and efficient manner. A methodical, routine-based approach to roofing tends to keep new roof costs reasonable. Efficiency of process allows us to service a larger number of customers with a faster turn around. This means we’re ready to start your job as soon as you are. Charm City is our home! We are proud to offer our expert craftsmanship and outstanding customer service to the Greater Baltimore area. Although our name conjures famous Baltimore landmarks from the Inner Harbor to Camden Yards, our services extend beyond the city. Customers from Anne Arundel County, Baltimore County and Howard County are in luck! All of these areas are treated as our home, and benefit from the same level of care and quality that our customers within I-695 receive. 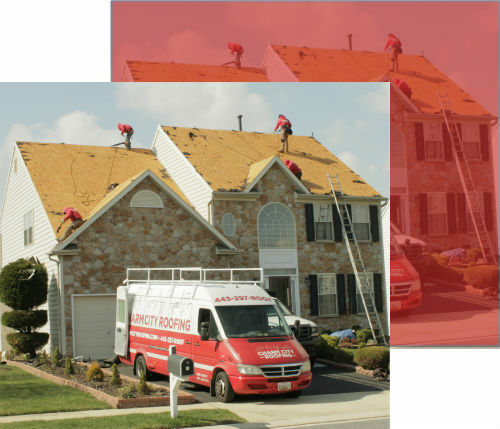 At Charm City Roofing, we get each job done properly and promptly. Every client is approached as an individual, and special considerations are made for every job, regardless of size and location. From the tree-covered lots of the Baltimore suburbs, to the hard to access commercial buildings of the inner city, our team has seen it all, and has the equipment needed to deliver. Our experience is unmatched in the area, whether you’re replacing a steep slope, shingle or flat rubber roof. Don’t take our word for it. Inspect some of our past jobs. Read the many testimonials of our satisfied customers on this site. We’re confident that you’ll reach the same conclusion that hundreds of other Baltimore Area families have come to: Charm City Roofing is the only local roofing contractor that offers professional quality at sensible prices.